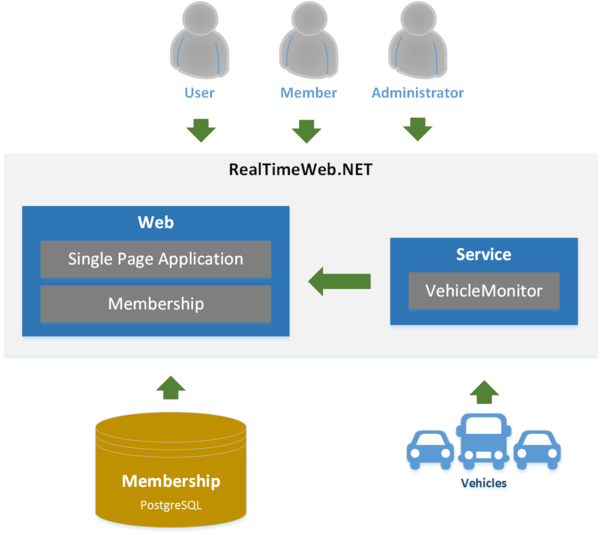 RealTimeWeb is a real-time web example application written for .NET Core, the latest multi-platform .NET version. It demonstrates the usage of some new technologies mixed with some proven practices. On the front-end it uses ASP.NET Core and React. On the back-end is a uses RabbitMQ for messaging and PostgreSQL for data storage (not yet finished). Docker images are used for deployment on an Amazon ECS cluster (EC2 Container Service). 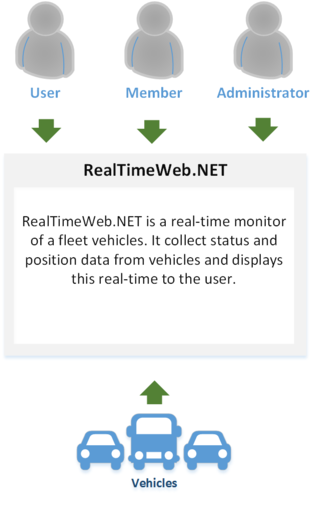 RealTimeWeb implements a simple use-case, the monitoring of vehicles of a fleet. The goal is to collect status and position data of vehicles and to push it to the web-application in order to display this in real-time to the registered members of the application. In the current example the data is simulated for demonstration purpose. The RealTimeWeb system mainly consists of two parts: a web-application and a service. The web application presents a SPA (Single Page Application) written in React to the user. It also contains the Membership domain used to manage registered users of the system. The service hosts the Vehicle Monitor which collects the data from the vehicles. This data is pushed to the web-application and will be simulated for demonstration purposes in this example.